First look at Jibo the home robot Jump to media player The BBC is given an early look at Jibo - a "social" robot for the home, which is set to be released kater this year. Drone lands on moving car in Germany Jump to media player Roboticists in Germany have taught a drone how to land itself on a car travelling at 75 km/h (47mph). Robots dance and run at CES Jump to media player A quick look at three new pieces of robotic gear at this year's CES trade show. Social robot wants to be your Buddy Jump to media player A robotics company from France is at CES to show off |Buddy - a social robot that can help around the home. Light-up robot could help autistic children Jump to media player A robot is being launched at CES that could help children with autism, Down's syndrome and other developmental disorders. Pilotless drone to transport humans Jump to media player A human-carrying drone is one of the transport innovations on display at the CES tech show in Las Vegas. Machine mixes custom-made moisturiser Jump to media player Cosmetics company Romy Paris develops a machine that can mix a custom-made moisturising cream to suit an individual's needs. 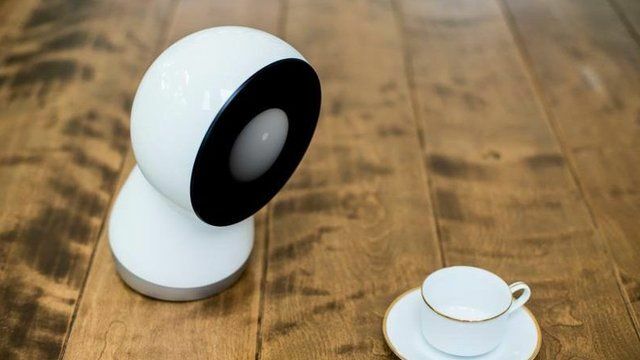 Jibo is being marketed as the world's first "social robot for the home". It promises to synchronise the family calendar, provide a more friendly way to video chat and even take photos at family celebrations. The crowdfunded machine is set to go on sale later this year for $749 (£529). But when the BBC's technology reporter Jane Wakefield was given a demo of a prototype unit, its functions were still very limited.